Lore of ZenDasalen and The Vendassin Name. ZenDasalen is where the exile people from all walks of life resides. The good dont exists there nor a promise land of wealth and prosperity. It promises nothing but the guarantee of death to those of good which is seen weak. Everything and every person that is ugly and isnt humane, ZenDasalen is where anyone can be found. 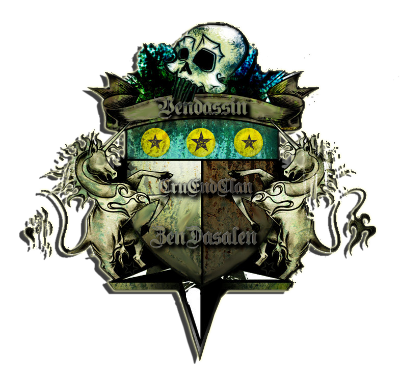 The murders, Rapists, Sinners, all around; the corrupted lost souls of all different backgrounds is what makes ZenDasalen the Nation of the most Crude and Evil Society as of now. The surroundings may seem in the medieval times, but dont let it fool you. Since the Leader of the Nation, of ZenDasalen dont believe in upgrading the buildings, due to the consistent violence which is held everywhere besides Atlantiss City. The leader leaves everything as is, roguish and dirty. Yet dangerous because one might not know of a weapon that isnt from the world ZenDasalen resides in. ZenDasalen accepts not only people around the world its self, but those from different times and universes. Making knowledge of other places strong for the Royal Family. You have read correctly, a Royal family proudly resides there and helped shape ZenDasalen how it is now. A person or a few would ask, why would anyone want to lead a society of ruthless, heartless, and even merciless killers? Its because the Royal family is just that, but more sane about it. The Vendassin family comes from a long Lore of misfortunes and incredible events that lead to such a powerful outcome. Before the name Vendassin, it was actually named the Forsaken. The Forsaken is a Clan from where Amazonian women whom ruled over the male Amazons. (After ruling over the women.) The women made their Clan the strongest around in their era. Because of the curse which was accepted from one members from the clan. (A woman) Which bestowed upon the other Amazonians. Making them bewitched, also having an irremovable ancient bonded souls to only the women and the males; being blessed at birth with extremely heighten intelligence and stamina. Unless inherited something from the male side and in a different case for a male. The bay would inherit abilities from its mother is strong enough to be breed with. The Forsaken was shortly lived after 10 years of their thriving abilities they knew nothing about back then, because they lived in peace and accepted love in their life. They knew nothing about the cursed gift then. They were all cut down by an unknown person who was paid to take out the Clans Village as they slept. The slaughter only left two people alive. Which was Cinna Forsaken who had took their Clans name as her last name after the massacre. Soon after her 18th birthday. Cinna became known as Sinn, whom her bonded soul came to rise and destroyed many lands, that gave her the thrilling pleasure of striving fear into those who wasnt willing to join her evil path of conquering and destroying. Sinns era was none the less, more decaying then the future. Yet she was strongest and on the fact, she noticed through out the years of using Cinna as her vessel. The human body restricted her still, from using her full power. During the time of meeting wars on the field and conquering foreign lands and baring her fruits of evil. Sinn in secret found a scientist that wasnt from her world, which she found the best, by exploring other worlds through her portal. To reinstruct her body she once had, but this time making better and more lethal then before. For this to happen, the scientist needed samples of what use to be Sinns ACTUAL body. It wasnt an easy task but Sinn provided it after a few years of seeking for it and fighting for it. Several years later, Sinn fully inherited Cinnas body. While at war with the WinterSuns. During that war Sinn forged a large army at the village Cinna was from. (Which is still standing) A Clan whom she reformed as the Forsaken. Her leadership wasnt as smart then, but her power is what feared them the most. With years back and forth with getting information about the Wintersuns for an ultimate attack. Sinn was killed by her only husband, Kyuzo Yasuka and the people she exhiled from her Clan. This left her Clan in the hands of her last living children. The twins, Ameki Yasuka Forsaken being the first to be born and Zyse Yasuka Forsaken, the second. Their father Kyuzo Yasuka was the only man whom was formally pronounced leadership of the Clan through marriage to Sinn. Which fled with the exiles. Ameki after reading her mothers journal that was purposely made for her to followed to be tricked into ruling the way Sinn wanted her to even after she death. Ameki followed and fell in love with her brother Zyse. They both fled from their lands to kill all who was involve with their mothers assassination. After a continuous mission for three years, they were down to the last one. Their father Kyuzo, which they couldnt bring their self to do it. They soon went back to where the Forsaken reside at and gave them a false kill. Later, it was announced that Ameki and Zyse was to be married. The more Zyse watched how his sister/lover became more obsessed on becoming like their mother. The mother he hated his mother who visited him in secret but never Ameki. He knew personally Sinn was manipulating, but for what? He didnt know. Later down the line, Zyse became worse then his father and mother in secret. As for Ameki, she unexpectedly found out she conceived. This was the perfect time Sinn as a bonded spirit catch the bonded spirit that was bonded to Ameki (Usha) weak and forced her ruling over Ameki and Usha. Since a Forsaken/Vendassin delivery is their vulnerable point in their life. When Ameki birthed Sinn struck a deal with the devil, if he allowed her one more chance to possess another soul for just a short time, to kill Ameki and posses her body because she could only use a Forsaken Vessel; she would deliver more souls then he could ever have. Of course the Devil agree to such a deal. So at the birthing of Dosai Yasuka Forsaken. Sinn took her grandson and killed Ameki after she spoke the spell on giving her body up even after death. Thats when Sinn killed her and immediately transferred her soul into Amekis body. Which she soon vanished after with Dosai. This left Zyse at a far when he heard of the news, raging with such a pain he thought could never exist. This sent Zyse off the wall, he abandon his chair of leading the Clan and left for years to never be seen again. Sinn after a couple of years, went back planning what she didnt get to finish. The ultimate attack on the WinterSuns, which she felt she needed to do a second time after the first time around. Seeing she got word that theyre planet still lived. This is when she sent Dosai away for training as she did with all her kids, to train high up on top of a mountain in the rainforest with evil spirited monks. Sinn became highly obsessed on getting the information this time around perfectly right, but! Sinn was killed because of her blinding rage for power and knowledge of the WinterSuns by one of their other enemies. The medagogs. Now this was the end of Sinn, but what of her clone? Since it took many years for the scientist to perfect it, she didnt take notice of Sinns absents of visiting tll she was close to the end of perfecting the clone. She never knew Sinn was killed neither since her project was something that no one knew about. So, the scientist waited about another year, and nothing showed up from Sinn. Which she made her decision on her own, what to do next. The scientist knew the clone was only made to be just a vessel, but since Sinn never came back. The 80% of memory that was implanted in the vessels brain from what Cinna and Sinn been through in their life up to Sinns last visit is all what was implanted. Meaning the other 20% needed to be placed with other stuff. Which the scientist did so. (In which she did to the Clone is SECERECTLY ENCLOSED) Not only did the scientist change her mind just a little but changed her body extremely! When the Clone woke, she woke up at the age of 24. She knew who she was, Sinn and over time she called herself Sinn Forsaken. Of the Forsaken Clan, but after training with the scientist The secondary Sinn made her appearance. Looking for the Clan that was left at the village. Lucky some still resided there, the loyal ones and the others fled once they heard Sinn was killed. Almost immediately they were ready to fight this woman that approached them without a fear marked across her face. Once they gor a better look at her, they seem similarities of Sinn. The secondary Sinn regained her spot as the leader, some didnt accept her because she wasnt the actual Sinn in their eyes and this left an uproar. Which Sinn told those, If they didnt like it they were more then welcome to leave. Which few did, and immediately Sinn killed them before the took their third step. Showing the clan what would happen to them if they left the clan they so willing gave their oath too. That is when she showed dominancy without force. She wasnt like Sinn and in fact she was a lot different but looked on as 51/50. She displayed little of her abilities that misled people to think she was weak. This was something a lot of the clan members took notice of. They learned to respect her since she wasnt too strict and she had little rules she asked for all members to live by. The more she grew the more she learned off Cinnas and Sinns experience, to the secondary Sinn she felt that they were just a big mistake to learn from. After finding out what happened to the first Sinn and the truth of the WinterSuns. Since the first Sinns obsession attack over the WinterSuns, when Sinn got the actual rumor theyre might be life after the lethal attack. Sinn once again became actually obsessed without confirming it the rumor was true. Because the WinterSuns was indeed killed. While SothisRaWinterSunII was in rule. This gave Secondary Sinn time to show her presence, correct mistakes that were done in the past and organzie her Clan. She met Valkryion StarGazer whom she had her first child with Kai Ergo Forsaken. Like the first Sinn she felt she needed to send her child away, but in the back of her mind she didnt want to and she felt it was wrong. After 8 years of her ruling. She was starting to gain the name Queen Sinn. More respected. She killed and waged more deals as if peoples lifes were cards. She actually played with minds. She didnt raid villages or towns. She watched and observed and if she wanted something she took it and killed everyone around, she didnt even give those a chance to be forced to join her or not. The secondary Sinn was actually more organized and less crazed unless Sinn taunted her through her ill mental state telepathically. Sinn was scouting for a land that was once conquered by Sinn. Through her memories she tried to scout for it, but soon it was interrupted through a message that the temple her son Kai was training at was burnt to the ground. This had Sinn rush to the mountain more faster then anyone had ever seen her do in a fight against a person. Once she was there, she found it in flames and no survivors. She didnt cry about it, but she did take a moment of salience as she stood there and watch. After years she long forgotten about the land she wanted. She was at her first full blown war with a past foe of the original Sinn. Sara. Sara met Envy in a one on one to the death. Envy came out in a moment victory. Which a Ball would be held after. Before the Ball, Secondary Sinn started to notice this kid that hung around the village. She didnt know why he was around, but some how he was allowed in the underground domes that were built after secondary Sinns wake. Around the Ball, they claimed their victory. But later a fight broke out between an member and the boy whom again was seen this time attending the Ball. Sinn broke it up and second later, the clan member revealed the fact that the boy was her long lost son. The boy confirmed it to Secondary Sinn and in rely she slapped the hell out him for not coming to her sooner, but of course she didnt express that verbally. Later Secondary Sinn met with a long forgotten face, Zyse whom questioned and claming that she would never be the mother he once knew. He mocked at her and laughed. Secondary Sinn ignored him though after submitting a few words he wasnt approved of. Leading back to his son Dosai. A Grandson that was soon killed later on down the line. Because of his secretive plan on cloning Secondary Sinn without her knowing. After many years of growing, the Clan was reaching beyond the village growth. This led back to Secondary Sinns idea of that land she was seeking for news of the Temple being burnt down with her son residing there. She ordered her son Kai and a few others to scout out the area, this was Kais first mission from home without his mother. Even though Sinn killed half of her kids because numerous reasons, Secondary Sinn would do the same if she had too without remorse. Unless it was a female. Since Secondary Sinn wanted to be the only woman from a long lost clan with such a curse. But seeing how Secondary is a clone and the only thing that ties her back to the Forsaken blood is the tissue that was placed from her from the decaying body of Amekis possessed self. It still worked out perfectly. She just had to make sure she killed the girls she birthed if she ever did and made sure that her son Kai and Zyse gives their seed to a woman that can be strong enough to birth a girl but of course a male. After getting confirmation of such a place. Secondary Sinn made up her mind about the future. She announced to her people. They were moving. Not to a village, not to a town, but to a Nation. Where all the exiles whom she gladly accepted could reside at. She didnt want to be known no more as the Forsaken Clan. She wanted to be recognized as her own person and not in someones shadow who was killed because of their own stupidity. This is when she changed the Clans name to CruEnd, meaning Cruel End in LenDalen a native tongue that they soon picked up quickly but extremely hard for anyone to really understand it. Since the words are very different an changes over time. The language isnt from their world. Then She announced the Nations name, ZenDasalen. Meaning, Broken Elegance. Then finally she announced her name. Queen Envy Vendassin, of the CruEnd Clan. Over time from moving to ZenDasalen, the transition was perfect. They went to war more and people willingly joined Envy and her the CruEnd Clan. Those who wasnt fit for the CruEnd Clan Reside at Endless Days to be called on for extra hands by the Elders, by the Royal families request. The Nation Became more organized then ever before. They war, kill, trick, and even deal for high prices. Envy was known to be silent in her ruling and step when it came to her. Even crazy, but dont be mistaken. She has a plan to even enter the gates of Heaven and take it over.
. Be a CruEnd, become history in the making?